2013 was a monumental year for me as it ended with me leaving my permanent job of twenty-plus years with the determination to seek a more balanced life. Choosing focus as my word/theme for 2013 helped me to realise that my job had become overwhelming and was never going to give me the work life balance that I so desperately crave. This year I find myself starting the year with increased energy, greater resolve to carve out a life built upon my dreams and values and increased levels of self-acceptance. 2014 has started positively for me but I know it's going to be challenging along the way as I work out my new direction. After much dilly-dallying I have chosen the word purpose for 2014. I hope it will guide me in the direction of a simpler and more meaningful life. - downsize my possessions and wardrobe further considering the purpose of all that I own - what do I really need? Can a simpler less materialistic life be purposeful and happy? Care to share your word/theme for 2014 ? How's it going so far? I am certain I'm happier with a more minimal life. Wishing you happiness for 2014 and good luck with exploring your word. 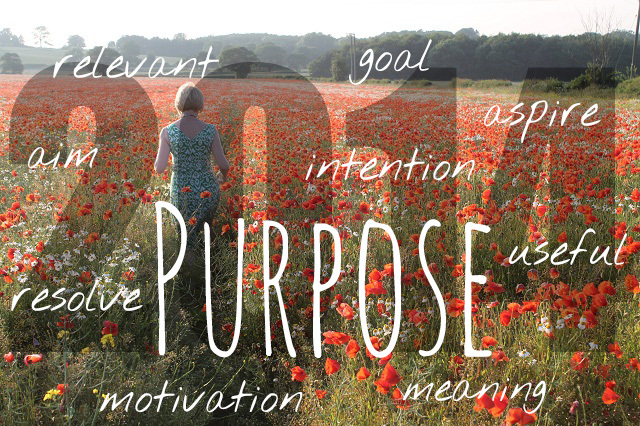 Purpose is a brilliant word for the coming year and I love how you have written about it. It is positive and forward thinking, it makes you want to strive for better and yes, simpler things. If things have a purpose they are needed and necessary, I love it. And YES, a less materialistic life can be purposeful and happy, If everything you own and do has a purpose your brain can process it's thoughts in a clear and concise way, it's almost like getting back to basics, which is my phrase for the year. And up to now it's going slowly but it's one of those things that there is no need to rush, I am happy for things to drift away until only the basics are left. I'm very excited about your 'Back to Basics' year - my year will be more frugal so I'll be following you to gain inspiration! I'm so happy for you that your 2013 "focus" brought such positive results! It must feel great. For me, we really need to actively realise that we have "enough", in so many areas - not just pay lip service but really follow up on knowing we don't need more of ANYthing!! Purpose is a good word for the year - mine is "less" and it is going really well so far. However reading Gretchen Rubin's Happier Home at the weekend I also realised that it is ok to keep some of my stuff - it was beginning to look like we'd been burgled - lol! I left my teaching job to stay home and write and loved it but am now thinking of dipping my toes back in by taking on a temporary teaching post. I guess there is a season for everything and a change is as good as a rest! Gretchen does present a balanced argument regarding downsizing possessions and points out that some things we own can make us happy. Good luck with the teaching - I agree a change can be very energising! Life with less materialism does feel more purposeful, and meaningful. I have been on this frugal journey for some time now and although I don't consider myself "minimalist" I don't have a lot of the possessions my peers do. I have de-cluttered my entire lifestyle and as a result, I feel free and I am much more relaxed. When I consider how most people live, globally, I feel extremely fortunate. Claire you are sounding so wonderfully positive after your year of "Focus" and as you begin this year of "Purpose".The changes you made last year were big ones but born out of the insights of your focus on the lifestyle you want. Wishing you great success in 2014!